I’m pretty open minded when it comes to chocolate chip cookies, but adding cinnamon and ginger and rolling them in powdered sugar is where I draw the line. At that point they’re just spice cookies, right? Or at least that’s what I thought when I first saw Hal’s Favorite Chocolate Chip Cookies. I’m glad I actually tried the recipe because it totally exceeded my expectations and was a huge hit at work. These definitely fall into the chocolate chip cookie category rather than the spice cookie category. Technically they are both, and what I promise you won’t feel like you wasted your calories on a weird spice cookie with chocolate when you could have had a traditional chocolate chip cookie instead. Something about all the nuts (don’t leave them out), the overall texture and the amount of chocolate chips make them more like chocolate chip cookies with benefits rather than spice cookies. That said, they would be an amazing addition to a holiday Christmas cookie tray, which is news you can use in March, right? Sorry, ya’ll. I plan ahead. Anyhow, try these! You can find the full recipe for Hal’s Favorite Chocolate Chip Cookies on Texas Co-op Power’s website. If the link doesn’t work, leave me a comment letting me know. 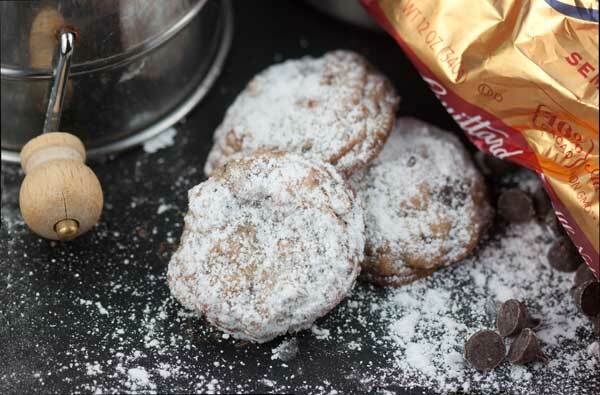 A cross between chocolate chip cookies and sand tarts, these cookies are perfect for the holidays. Preheat oven to 375 degrees. Line a baking sheet with parchment paper or foil. Mix together flour, baking soda, salt, cinnamon and ginger, and set aside. In a large mixing bowl, beat butter and brown sugar until creamy. Add the egg and vanilla and stir until blended (do not overbeat at this point). Gradually add dry ingredients to butter mixture and mix well to form a soft dough, then stir in pecans and chocolate chips. Chill dough several hours or until it is firm enough to shape into balls. Form the chilled dough into 1-inch balls and roll in powdered sugar. Arrange balls about 2 inches apart on lined baking sheets and bake 8-10 minutes. Let cool on baking sheets about 5 minutes, then transfer to wire racks and dust with more powdered sugar. Yield will vary. I've been making the cookies smaller and getting about 35 cookies. Until I read the full article, I thought these were your dog’s favorite cookies. Regardless, I really want to try these! Stephanie, I know what you mean. Cindy, not really. They look a bit like Mexican Wedding Cakes, but the texture is that of a firm, non-cakey chocolate chip cookie. You could add cardamom to a portion of the dough and see what you think. I’m not a huge cardamom fan, but I think it would actually taste very interesting in these. Are these similar to Mexican wedding cakes? And I’ve started to add cardamom when cinnamon is an ingredient, wonder how that would be in these. Looks good. I will definitely give these a try! Love finding new chocolate chip cookie recipes.